Success is always more fun as a team! 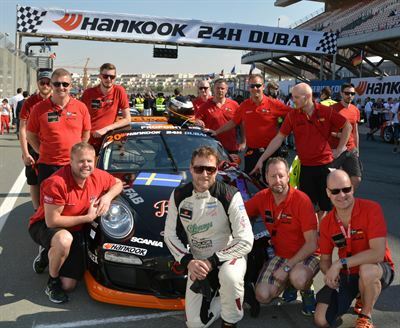 Marcus Fasth, Section Manager at ÅF and Team Leader for a great racing team, just got back from a 24 hour endurance race in Dubai. Let's see what he has to say about it! Marcus, you are a Section Manager here at ÅF, but when you’re not at work your main passion is racing. You and your team were recently in Dubai, competing in a 24-hour endurance race. Tell us a bit about your role in the team. I’m involved right from the start, as soon as we decide to compete. First there’s the planning phase, which includes registering to enter and defining the budget. Then we look at staffing, making sure we have the right skills and attitude on board, and we select the appropriate drivers. Phase two involves more specific details, such as the car’s technical specifications and equipment for the team, including everything from tools to camp beds. In phase three we look more at how we’re going to approach the race, driver preparations, fitness training and team-building exercises, all so we can feel as well prepared as possible and ensure we work effectively as a team. What about the actual race – how do you compete in a 24-hour race and how did your team perform? The race is a massive team effort, particularly when you’re driving for 24 hours. Each driver can drive for a maximum of two hours in the car and during the pit stop you change drivers, refuel, change tyres and make any necessary repairs. Meanwhile the race is in progress all the time, so the entire team has a huge impact on the result; the less time we stop for repairs, the better. This year’s Dubai 24 Hour had the biggest starting field in the race’s 11-year history, with 100 cars on the starting grid. The race has grown over the years and since our team’s car had a 2010 specification, we expected to come about 50th. With a concerted team effort, we managed to work our way up to 20th place, which was a fantastic achievement. What’s the biggest challenge of competing in such a long race? Keeping your concentration levels up when tiredness starts to creep in. It’s about continually working to support one another, and my role as leader is to make sure nothing has a negative impact on our performance. How did you and your team prepare beforehand? On the day of the race I have to keep up a constant dialogue with drivers and mechanics from early morning until the race ends. I need to maintain a high level of fitness in order to keep going for over 30 hours, so I’m down the gym 4–5 days a week. Each driver has their own training programme and they start stocking up on fluids several days before the race, because it can be 60–70 degrees in the car during a driving session. What lessons learned from racing can you apply in your professional role as a manager at ÅF? And vice versa? The most important lesson is realising just what you can achieve if everyone is pulling in the same direction, and how vital it is for everyone to feel involved and part of the team. In racing I’ve learned the importance of correct and clear information, so everyone understands what needs to be done. As team members are working in the crowded pit lane with cars moving in high speed you must be sure that all information is crystal clear to avoid misunderstanding that could cause accidents. You also need to be careful with timing, giving information at the right time so that it will be correctly understood. What do you think makes a good team? When everyone in the team works to support one another and respects individual personalities. No team will ever be entirely without conflicts, but when a team is able to deal with conflicts together and turn negative energy into positive energy, then you know you have a good team. What’s your approach with your team when things don’t go to plan? How do you handle setbacks? And do you handle them in the same way professionally as you would with racing? When we’re out on a race we resolve any conflicts straight away, otherwise it will affect our immediate cooperation and results, so I can at times be very direct about what changes I want to see. At work I try to analyse the situation a bit more, to avoid making the wrong decisions by rushing it. For the 2016 season, my team PFI Racing will be entering endurance races in Europe, while my focus in Sweden will be on helping PFI Racing’s younger national team driver, Henric Skoog, progress from Clio Cup champion in Sweden and Junior Champion in Europe to a higher competition class, such as the Porsche Carrera Cup or the Scandinavian Touring Car Championship.